Fishing is an important part of Scotland's history and continues today. Many towns and villages in Scotland have been shaped by the fishing industry, its success and its decline. This resource introduces short films made in Scotland in the 1930s to the 1960s. This selection of clips shows us how fish was caught, processed and sold at a time when the fishing industry was in decline but still vital to coastal economies and cultures. These films have been selected to accompany the Learning Resource 'Fishing in Scotland'. The resource consists of a learning journey for teachers and worksheets for children. The resource connects with different areas of the Curriculum for Excellence (First and Second Levels), with particular relevance to literacy and social studies. 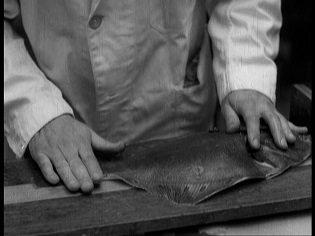 The National Library of Scotland's Moving Image Archive preserves many films that capture perspectives on fishing. A longer list of films is suggested for further viewing at the end of this resource. 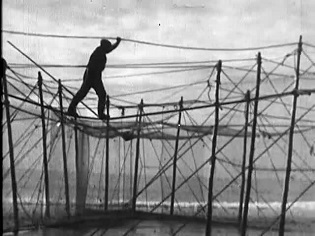 This film shows the herring industry. Men work on trawlers and women work on the shore, gutting and packing the fish. What do you see? What do you think is happening? Talk about any questions you have about the film. How do the fishermen spot a shoal of fish? What are the fisher lassies doing to the fish? Can you describe the sounds, smells and feelings the women would experience as they work? What sort of clothing are they wearing? Why? Why does this film have intertitles? What sort of camera angles are used to capture the people at work? This film was made to show people the work of the Scottish Fisheries Board. It shows us some specialist jobs done by people in the fishing industry. It was screened at the Empire Exhibition in Glasgow. What is the general mood of this film? How does the music used give you this impression? Make a list of all the jobs you are shown. Discuss how they depend on one another. Is the action in the film natural or staged? How do we know? This film shows different methods of salmon fishing on the east coast of Scotland at St Cyrus. The film was produced by famous documentarian John Grierson. How do the fly nets near the shore catch the fish? Make a list of the pros and cons of the different types of fishing method. Which method do you think is best and why? Why did the fishing boat take longer to return to shore than it did to go out? Do you recognise the melody played in the film? Why do you think this music was chosen? Listen carefully for changes in the music's tempo throughout the film. When is the music played faster and why? How many different shots can you count? How does the filmmaker make each shot look interesting? In this film clip we see how an Arbroath Smokie is made. You can still buy these today. 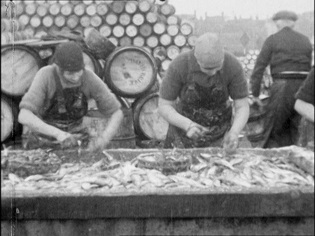 In the film, the haddock are cleaned, split and hung over smoking logs. Talk about the people in the film. Who do you think they were and were they related to one another? Where are the smokies being made? Where do you think the family got the materials they needed to produce the smokies? Why does the man cover the smokies with a cloth? Why does he sprinkle the fish with water? Why do you think this film was made? Who do you think the filmmakers thought would watch the film? Compare the films. Which do you think is most successful at bringing the fishing industry to life and why? Build a mini fishing industry in your classroom. Choose a job to do and interact with the others as they work. Create a soundtrack for one of the silent films using different objects and voices and a microphone. Make an animated film about fishing or the perfect smokie, inspired by the films on Scotland on Screen. Please refer to the learning journey and activity sheets for further ideas. There are other films about fishing which you may be interested in discussing. Links to these, and all of the films mentioned in the resource, are through the records at the bottom of the page. You can explore Scotland's food and drink history by visiting the National Library of Scotland's online learning resource Lifting the Lid. 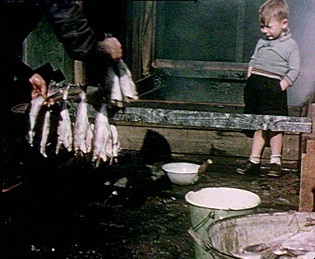 The Fishing in Scotland learning guide and resources were prepared by teacher Claire Docherty in collaboration with Scotland's Moving Image Archive. Created September 2015.